"When is the best time to go to Disneyland?" The answer to that question depends on your preferences, but there are factors to consider to guide your decision. You could go in the middle of the week in February, on a sunny day when there are no school holidays to avoid crowds—but there won't be any fireworks. Or you could think about going in the summer when all the rides are running, days are long, and you can see the fireworks and other nighttime shows every day of the week—but the heat and long lines come with that timing. Your trip is all about you, so the key is to understand the trade-offs of what you'll get and what you'll sacrifice so that you can pick your own ideal time of year. 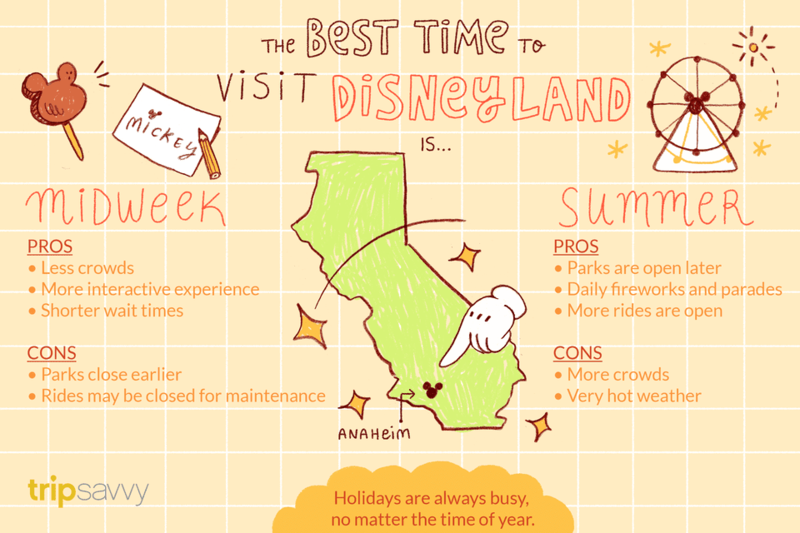 Generally, the best time to visit Disneyland is during the summer and holidays. At these times, Disneyland hours are the longest, meaning more hours to play, more things to do, and more rides to experience. Plus, parades, shows, and fireworks happen every day in the summer. Rides are also unlikely to be closed for maintenance then, which means there's less chance of missing out them. On the downside, Anaheim's summer weather can be so hot you'll worry you might melt. Anytime the hours are long, the place is also packed, leading to long waits. Hotel rates will also be at the year's highest, increasing your total trip cost. To pack in maximum value, visit in the middle of the week during less busy times of the year. When fewer people are around, it's easier to enjoy the company of your family and friends. You might even get to kiss Donald Duck or dance with Pinocchio. You'll spend more time having fun and less time waiting. January through March is the season that attracts the fewest visitors, except for holiday weekends and school breaks. On the downside, this off-season means you'll have fewer hours to experience everything. Some rides may close for extended maintenance and upgrades, and some nighttime entertainment may not happen on weekdays. Overall, Disneyland is the second-busiest theme park in the world, according to the Themed Entertainment Association, with more than 18 million visitors per year. (No surprise that Disney World is tops.) No matter when you visit, you won't be alone. January is a nice time to visit Disneyland to avoid crowds and experience good weather. Holiday decorations are still up for the first part of the month. Unfortunately, park hours will be shorter than other times of year and some rides might be closed for renovation during the winter. Lunar New Year festivities may start near the end of the month. February is among the quietest months at Disneyland, but it can be a great time to visit. The park is open fewer hours than in the summer, but it isn't crowded and you won't have to wait for rides. President's Day is celebrated on the third Monday of February and may bring slightly larger crowds that weekend. March can be pleasant—or overly crowded, depending on when you go. If you visit in March, try to go earlier in the month before school is out for spring break. Late March can be very crowded. Disney California Adventure hosts a food and wine festival that lasts through mid-April. Like March, April is also prime spring break time. If you want to travel in spring and your schedule is flexible, think about going to Disneyland in a different month. The park sometimes hosts an unofficial family-friendly event called Bats Day in the Fun Park. In preparation for the busy summer months, Disneyland often soft-opens new attractions in May. This can be a great time to visit, but avoid Memorial Day weekend as it's one of the busiest times in the park. The last Monday of the month is Memorial Day and is usually very crowded. June kicks off summer at Disneyland. Schools start summer break, which ups the crowds, but the park also hosts a full event calendar this month, including parades, fireworks, light shows, and more. Disneyland's annual Grad Night events continue into June. The after-hours graduation dance party is held in California Adventure. In July at Disneyland, you can expect long hours, but a full entertainment lineup and as many rides as possible will be open. Also, expect big crowds. On Fourth of July, Disneyland can get so crowded that it reaches capacity. When that happens, they sometimes can't let any more people in. August at Disneyland is hot and crowded. Disneyland is open long hours, typically between 14 to 16 hours per day, which gives you plenty of time to have fun. You can also expect a full entertainment lineup of parades, fireworks, and light and water shows. CHOC Walk in the Park is charity 5K that takes place in Disneyland in late August. It benefits Children's Hospital of Orange County. D23 is a big Disney fan expo held in August every other year at the nearby Anaheim Convention Center. If you like nice weather, minimal crowds, and short lines, September is a great time to visit Disneyland. Crowds taper off after Labor Day weekend and stay low until Halloween festivities start later in the month. Disneyland kicks off Halloween celebrations in September. Prepare to see plenty of Disney villains, plus a haunted mansion. Mickey's Halloween Party also occurs on select nights. Disneyland celebrates Halloween all month, including decorations and celebrations. Visit for Mickey's Halloween Party when children can go trick-or-treating throughout the park. Visiting Disneyland during the days when Mickey's Halloween Party is always a fun time. Gay Days are an unofficial event, held in early October, as part of Anaheim LGBTQ celebrations. Early November is a nice time to visit, with few crowds, but the park gradually swells as it gets closer to Thanksgiving and the holiday season. Disneyland's holiday celebrations begin early in November. Events vary by year, and you can find a list on the Disneyland website. Besides enjoying the holiday decorations, in December you can watch a special holiday parade and fireworks, visit with Santa, or attend the annual​ Candlelight Processional. December can be crowded, especially on holidays. The Candlelight Processional is an old-fashioned celebration of the season, featuring celebrity narrators. It's typically an invitation-only event. New Year's Eve brings a special fireworks show—and maximum crowds.